While many summer movies put superheroes on display, Oklahoma’s summer months gave birth once again to real-life heroes. When wildfires raged in Colorado and other parts of the West, Oklahoma Baptist Disaster Relief volunteers rose to the occasion to offer help in the recovery. Weeks later, when fires devastated tens of thousands of acres in our own state, destroying hundreds of houses and causing injury and even a death, Oklahoma Baptists again responded. The massive ash clean up effort continues to this day. 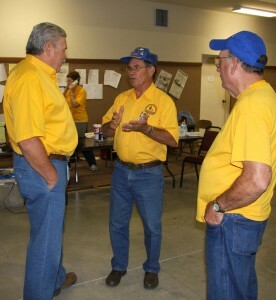 I recently had the privilege to walk among the BGCO Disaster Relief volunteers. In places like Mannford and Olive, men and women are tirelessly spending hours cleaning up piles of ashes where a house once stood. They pray with victims of the fires, while our churches open their doors to those in need from the community. The outpouring of love from volunteers I met, like Gary and Liz, Bob and Darrell, is truly moving. These everyday heroes may never grace the silver screen, but Heaven surely takes notice of their efforts, as do the families and communities they assist. Disaster Relief, time and again, proves to be a signature way Oklahoma Baptists make an impact for the Kingdom of God. That is why it is one of the key recipients of funds for the Edna McMillan State Missions Offering (SMO). Each year, Oklahoma Baptists have the opportunity to unite in giving toward missions efforts in our state. This year’s offering has a goal of $1.05 million. The previous year’s goal of $1 million was met and exceeded, and we believe our churches will yet again answer the call to give. The theme for this year’s offering is “We are Oklahoma Missions.” In addition to Disaster Relief ministry, SMO funds go to fund more than 20 vital programs, including student evangelism, church planting and chaplaincy, as well as funding anti-human trafficking and hunger relief efforts. To hear stories of specific lives that will be changed, visit www.bgco.org/smo. The gifts, prayers and efforts of Oklahoma Baptists, when combined, are anything but small. When disasters, hunger and hurt are so close to home, the State Missions Offering provides an excellent opportunity for each of us to be part of the solution. This is our time to support our everyday heroes.